A Healthy Community Builds on Acceptance, Patrick J. Howell, S.J. Up or Down—Both God’s Gifts, Stephen C. Rowntree, S.J. Navigating Class on Campus, Steve Hess, S.J. Front Cover: University of Detroit Mercy, McNichols campus, early in the morning. Photo by Anthony Laszlo, a dental student at Detroit Mercy. Finding our Place, Thomas Lucas, S.J. Sports in Schools, Patrick Kelly, S.J. Being a Neighbor in the Hood, Gilbert Sunghera, S.J. Sanctuary for the Heart, Howard Gray, S.J. Sanctuary: A Place Apart, Edward W. Schmidt, S.J. The Winter of Our Discontent, Gerry O’Hanlon, S.J. The 500th Anniversary, Patrick Howell, S.J. Forming Thoughtful, Committed Citizens, Lucas Sharma, S.J. Come To Believe, Stephen N. Katsouros, S.J. Milestone, a Challenge: Let the Conversation Go On, by Edward W. Schmidt, S.J. Jesuits Elect a Venezuelan as the New General, by Patrick J. Howell, S.J. We Remember a Great Educator: Peter Hans-Kolvenbach S.J., by Edward W. Schmidt, S.J. Reaffirmation of Jesuit Mission by the 28 Jesuit Colleges and Universities in the United States - A Brief Overview, Michael J. Sheeran, S.J. Democracy, Culture, Catholicism, by Michael Schuck and John Crowley-Buck, eds. A Partner with the City of Cleveland, Robert L. Niehoff, S.J. 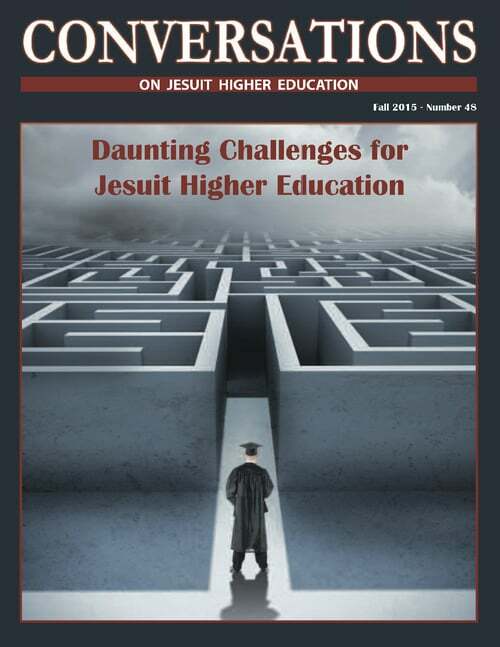 Student Debt Narrows Choices, Sarah H. and Martin M.
The Spiritual Exercises as a Foundation for Jesuit Education, Kevin O’Brien, S.J. The Grace of Directing the Exercises, Scott Coble, S.J. Ignatian Spirituality & Spiritual Exercises, Francis X. McAloon, S.J. Mission, Identity, Local Relationships, Jeff Dorr, S.J. Salt and Leaven, David C. McCallum, S.J. Making Sacrifices to Enhance Mission, Michael Sheeran, S.J. Between Image and Audience, Michael F. Tunney, S.J. Magis Catholic Teacher Corps, John Roselle, S.J. The Ignatian Adventure: Experiencing the Spiritual Exercises of Saint Ignatius in Daily Life, William E. Stempsey, S.J. The New Dawn of Pope Francis, Joseph A. Tetlow, S.J. Perpetually Abolished, Entirely Extinguished, John W. Padberg, S.J. A Remnant and Rebirth, Thomas W. Worcester, S.J. Shared Values, Creative Vision, Philip L. Boroughs, S.J. Transformative Experience of Magis in Brazil, Brendan P. Busse, S.J. The Real and Urgent Conversations We Need, James E. Hug, S.J.